Dionni has found the love of her life – once again – in a compromising situation. For Dionni, this is the final heart break. With the love and support of her family and friends, she concentrates on her business, and it’s there she meets new client, Xavier “Zay” Grey, an investment banker that hires her to plan a surprise graduation party for his baby sister. Timidly, Dionni begins to think she might have found “the one” for her, but a devastating secret finds her world once again shaken. It also finds her back in the arms of an unlikely man, and even more pain than even she could imagine. 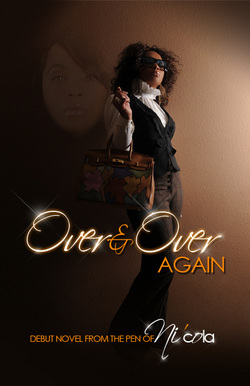 Over and Over Again is a funny and sensual tale that weaves between lies and love, deceit and truth, teaching Dionni the ultimate meaning of what is honesty, passion, and friendship.